Andres Alza, MD, shows the management of a dense brunescent cataract. Dense pseudoexfoliation cataract cases are quite common in Argentina. 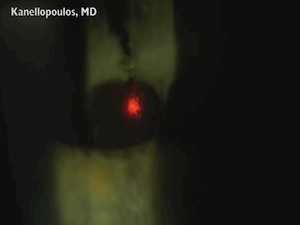 This videos shows how a relatively challenging case can be easily handled using an extra-capsular technique. This method is an option that every surgeon should know and could be applied when cataracts are too dense, show fiber zonular weakness and low endothelial count. Good﻿ video is another alternative to consider. Greetings. Good. But I feel safer with a CCC. A frown incision would be more astigmatically neutral. SICS is a very good technique for such cases. hahaha! You have not understood the message in this video but do not will worry when you will have an any problem you have the phrase "very crude technique". this is simply ecce using a longer shelved incision. nothing new here. and, inferior to the "3 minute" technique seen elsewhere (from india i believe), where a rhexis is achieved and is sutureless.